Students at Leicester University have started a project to design, build and launch a satellite into space. Twenty undergraduates in the department of physics and astronomy are involved in the mission to detect space dust. The main body of the satellite was donated this week by an engineering company based in Loughborough. 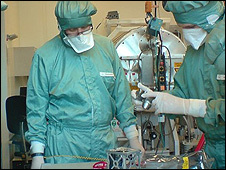 The project, named Plume, began in January 2007 and will result in an active nano-meteoroid dust detector going into orbit in mid-2009. Laura Evans, one of the programme leaders, said: "This is a major undertaking with Leicester undergraduates responsible for everything from inception to launch on a real space mission which will provide new, innovative science. "The nano-meteoriod detector on Plume will allow us to analyse dust particles that are smaller than ever before. "Our satellite will be looking at the near-Earth environment so the results will be very relevant and of interest to theoreticians as well as experimentalists. "Provided the mission schedule is maintained the satellite is likely to be the first English CubeSat in orbit." The team is also under consideration for financial support from the East Midlands Space Academy.